Are our schools doing all they can for all students? The 2015-16 State of Education in Tennessee report and the Tennessee Department of Education strategic plan, Tennessee Succeeds, both highlight the need to educate all children, regardless of background or zip code, so they are prepared for their future. The question is how. To explore further, SCORE convened a SCORE Institute, in partnership with Project Renaissance, to hear from Michael Petrilli, the president of the Thomas B. Fordham Institute and editor of a new book, Education for Upward Mobility. The book examines issues around how to help students born in poverty move into the middle class as adults. Acknowledging that obtaining a bachelor’s degree is a ticket out of poverty, Petrilli then focused on how difficult it is for unprepared students to finish four years of college. 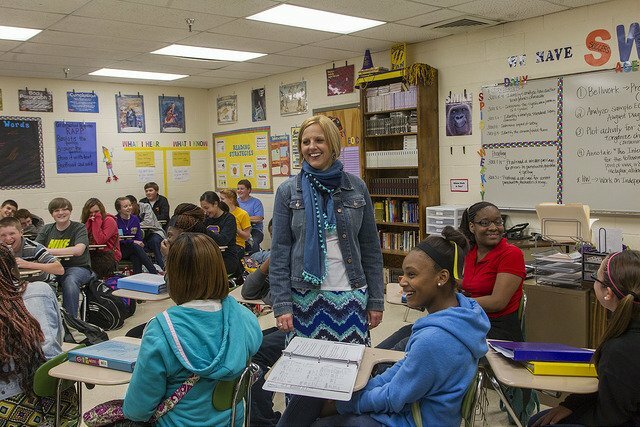 In Tennessee, ACT results show that only about 20 percent of students are fully prepared for college, while high numbers of students pass through high school only to be stuck in remedial classes in college. Petrilli emphasized building upon the foundation of high standards and aligned assessment with intentional focus on career and technical education as a way to give more high school students options beyond a four-year undergraduate program. For many students, associate-degrees and technical certificates are obtainable degrees that fit with their education background, Petrilli said. And postsecondary education of some type is crucial to ensuring upward mobility for lower-income students. Institute attendees learned that recent high school graduates in Tennessee earn only about $9,000 a year, a figure below the poverty line. A panel discussion led by SCORE Executive Chairman and CEO Jamie Woodson with Petrilli, Gini Pupo-Walker of Conexion Americas, and Mike Krause of Tennessee Promise and Drive to 55 examined how Tennessee can help more students find the right fit after high school. In many ways Tennessee is on the right track with CTE courses, Tennessee Promise, and a new aligned assessment in TNReady. But the panelists concurred that additional thought needed to be given to serving high-achieving low-income students and communicating to parents and the community about the continued need for high standards.